Whether you are the spoiler, ‘spoilee’ or both – as it should be – this Valentine’s Day, there’s no need to break the bank in order to kindle that loving feeling on this day of romance, cupid and roses. Don’t let cupid make you stupid. Below is a list of clever ways to properly romance your partner and still save money this Valentine’s Day. A home-cooked meal always wins out over a bulk-produced restaurant one. Only you can give the meal the special attention it deserves. It’s just not the same when it’s made by an overwhelmed restaurant chef cooking for hordes of unknowns on a busy Valentine’s Day. You know who you’re cooking for and you love them, and nothing tastes better than when it’s cooked with love. Looking your best doesn’t have to cost an arm and a leg. 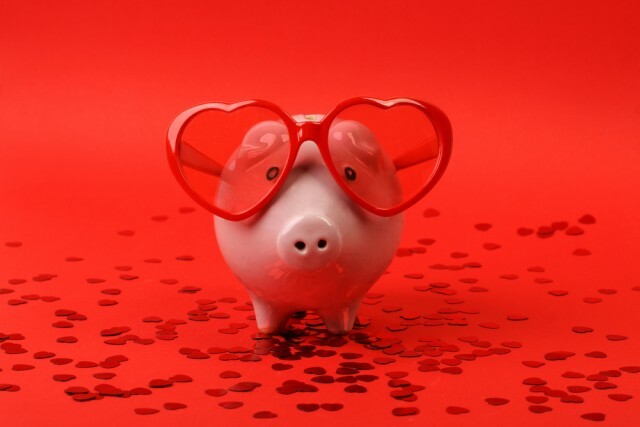 Borrowing a dress or a suit from one of your friends this Valentine’s Day can still make you look and feel like a million bucks – without denting your finances. Skip the salon and do each other’s facials and nails the night before – make an evening of it and pamper one another, so you all wake up on V-Day feeling vibrant. If you decide you still want to get out this Valentine’s Day, pick a place that offers a reasonable corkage fee. Pick up your own bottle/s from the supermarket and bring it along in a cooler bag. This way, you can circumvent those astronomical mark-ups and still get your bubbly on. A reservation at a good restaurant on the 14th is not only hard to get, but the meal itself is going to cost you a lot more. High demand on a popular holiday always presents the opportunity for restaurateurs to charge the pants off their patrons. Your bill and your options will significantly improve if you push the celebrations a day forward or back. Moreover, restaurants will be far less crowded and far more intimate – all the better for cosy romancing. When it comes to gift hunting, using PriceCheck undoubtedly proves that the grass can always be a little a greener if you scope out your options. So don’t settle on an unreasonable price tag. It doesn’t make the present any less meaningful or thoughtful because you haven’t thrown wads of money at it. It’s the thought that counts – don’t underestimate the authenticity of this old adage. Take note of what they’ve been eyeing out, then root around for a good deal. Discount or no discount, they will be most touched by the fact that you were paying attention. Put your back into it this Valentine’s Day, and offer up your own services – you’re bound to have a few skills you don’t share enough with your partner. Design a fancy voucher on the PC and print it out for your significant other. Gift them with a sensual massage, a three-course gourmet meal or a naughty show performed by yours truly. The beauty of this tactic is that your partner will likely return the favour. You see? Valentine’s Day need not be synonymous with splurging. And nothing dampens romance quite like the notion of added debt. Keep it simple and from the heart. Show that you care by protecting you and your partner’s financial future.